Sources close to Carmelo Anthony are saying the current New York Knicks forward has genuine interest in joining the Houston Rockets. Carmelo Anthony appears to be intrigued by the Rockets. The New York Post first reported it a week ago, and now Adrian Wojnarowski of Yahoo! 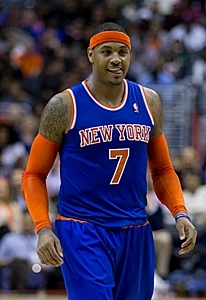 Sports is confirming: the Rockets could be a real player in 2014 free agency for Carmelo Anthony. In Wojnarowski’s latest column published Tuesday evening on Phil Jackson‘s arrival in New York, the esteemed NBA reporter cites sources close to Anthony as saying the current New York forward has genuine interest in Houston. “Anthony has free-agent options, and two have risen above everything else: Chicago and Houston, sources with direct knowledge of his plans told Yahoo Sports,” Wojnarowski wrote. To make the salary math work, the Rockets would likely need to find homes for Jeremy Lin and Omer Asik — either through a direct sign-and-trade with New York or to another team for cap relief, such as Houston’s trade that sent Thomas Robinson to Portland last summer before signing Howard. Jackson, who joined the Knicks as team president, said earlier in the day that he envisioned Anthony as part of his new team’s future plans, so the team will make a bid to retain him. And as with Howard in July 2013, the Knicks will be able to offer the 29-year-old Anthony a contract lasting five years, while no other team — Houston included — can offer more than four years. The New York Post also identified the Lakers and Clippers as potential suitors for Anthony once free agency opens this July.